DAMASCUS, SYRIA (2:00 A.M.) – Deadly urban warfare is underway in eastern Damascus as we speak as jihadist factions have sent hundreds of East Ghouta fighters into battle in a bid to break the siege of Al-Qaboun and Barzeh, two rebel-held suburbs. A few weeks ago, government forces de facto cutoff the aforementioned suburbs from the East Ghouta rebel heartland after demolishing an underground network of tunnels connecting the Islamist controlled areas. However, a surprise offensive launched yesterday by Hay’at Tahrir Al-Sham, Ahrar Al-Sham, Jaish Al-Islam and Failaq Al-Rahman briefly saw rebel forces link up with their comrades in Al-Qaboun through a narrow sector of Jobar’s industrial zone, opposition sources claimed. Although the situation remains volatile, government troops eventually repelled the assault and retook all lost buildings after SAA reinforcements poured into the residential area. At least 15 Republican Guards of the 105th and 106th Brigades were killed yesterday alone while many more soldiers of the 4th Mechanized Division also paid the ultimate price. Dozens of Islamist insurgents were killed during the government counter-offensive as well, bringing an unprecident death toll to the Syrian capital. Meanwhile, upon observing large gatherings of militants in the Jobar district, the SAA fired two surface-to-surface missiles into the embattled suburb, inflicting substantial casualties. With the Jobar offensive completely foiled, the 42nd Brigade of the 4th Mechanized Division and 106th Brigade of the Republican Guard are working overnight to secure more territory in the industrial area between Barzeh and Al-Qaboun in a move which may separate the neighborhoods in the near future. 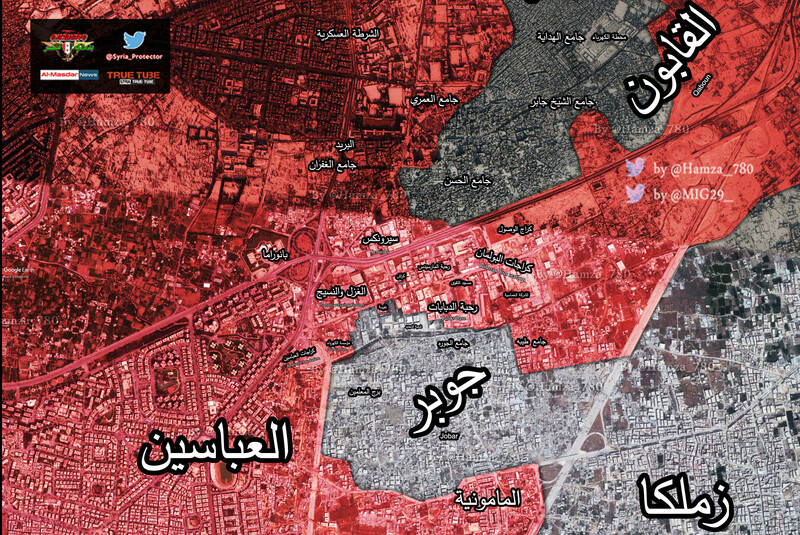 HD map of eastern Damascus here. A pesar de estar aislado los mercenarios, como entran las armas y municiones, el ejercito Sirio tiene que ser mas agresivo en control y ataque hacia los terroristas.